If you’ve ever been pregnant, you’ve heard of Lamaze classes. Did you also know that they have their own line of toys and books? After looking through the assortment of products that they offer to expectant mothers, I was in awe of the bright colors and adorable animals often found. 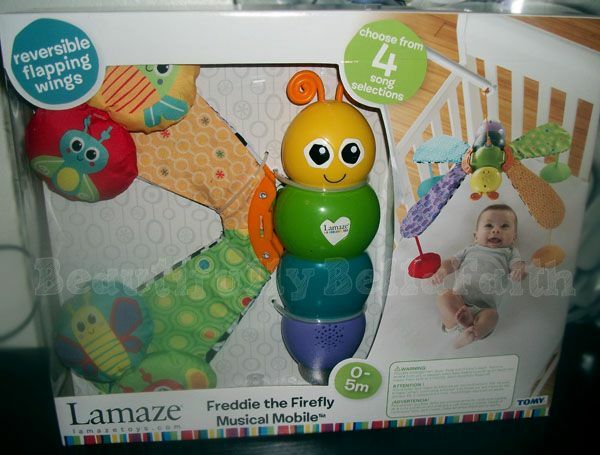 Lamaze and TOMY Toys sent me their Freddie the Firefly Musical Mobile to review. The precious firefly mobile can be placed on your baby’s crib, and you will instantly see the look of amazement on your little one’s face. The mobile plays four songs that soothe your baby to sleep. I know all about having a hard time getting your child to go to bed, and I only wish I had a mobile, especially one of this caliber. Not only are the songs soothing, but they also aide in auditory development. 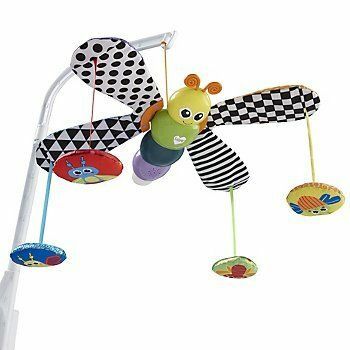 Lamaze Toys are known for their engaging and safe products for babies, and the Freddie the Firefly Musical Mobile is no different. The black and white colors found on the other side of the Freddie the Firefly’s wings will help build your child’s visual focus skills. Young infants gravitate towards those two colors the most. Freddie isn’t alone! He is accompanied by four hanging friends that move when his wings move. This helps to promote visual tracking in infants. One of my favorite features is that you can choose between two different modes – 15 minutes or 30 minutes. If your precious bundle of joy is having a difficult time snoozing off, this is perfect. As long as they’re not fussing, this mobile is perfect for aiding them in drifting to dreamland. Isabella kept playing with the mobile as I examined it. As a reviewer, I look over every crevice and inch of a product to ensure that I am being completely honest with my readers when recommending a product. With that being said, the Freddie the Firefly Musical Mobile is flawless. This would make for an amazing baby shower present! You can purchase Freddie the Firefly Musical Mobile for $49.99. I like the octotunes toy! I like the pink pony and princess sophie set. i like Jacque the Peacock also ! I’d love to try the Lamaze Space Symphony Motion Gym. Thanks so much for the fantastic giveaway! I’d like to have the Space Symphony Motion Gym. I’d love to have a My First Fishbowl. I’d love the Activity Spiral. i like the sea carousel! We’d also enjoy the Discover the Sea Carousel. I like the Octotunes. So colorful and cute! I also love Marina the Mermaid, such great products, thanks for the giveaway!